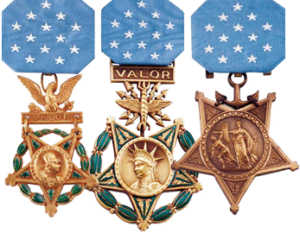 Awarded to any person who was taken prisoner of war and held captive after April 5, 1917, during World Wars I and II, Korea and Vietnam conflicts and Operation Desert Storm. 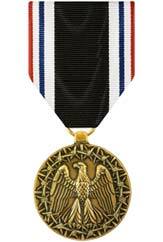 Though not authorized until it was approved by President Ronald Reagan in 1986, the POW Medal was created with a grandfather clause making it an approved award to all former Prisoners of War since the beginning of World War I. The legislation authorizing the award does require that the conduct of the POW was honorable during their imprisonment thus preventing presentation to collaborators. The award is presented posthumously to the next of kin of deceased Prisoners of War.